Dr Steinmetz believes in a holistic approach to treatment that addresses all of the health and lifestyle issues that factor into a patient's medical problems. 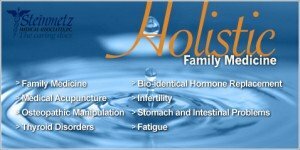 She begins with treatment emphasizing the most gentle and non-invasive approaches that will achieve results such as nutritional supplements, herbs, and acupuncture. She will only progress to prescription medication when needed, carefully balancing the risks and benefit to her patients. Her goal is always to restore optimal health and empower her patients to successfully maintain a state of well being by becoming stewards of their own health. 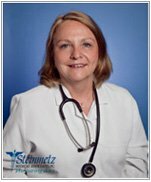 Marie Steinmetz, MD, has been advancing a comprehensive approach to healthcare since 1997, when she established Steinmetz Medical Associates, PC. about her patients as possible. She strives to create a partnership with each individual to develop customized treatment plans that integrate the best practices from both conventional and complementary approaches to treatment. A practitioner of both family medicine and emergency medicine, Dr. Steinmetz has held clinical positions at Georgetown University, George Washington University and Medical College of Virginia. She also served as medical director for the City of Alexandria’s Methadone Program. In 1986, Dr. Steinmetz founded Alexandria Family Medicine, serving as president for 10 years. She moved to California in 1996 to enhance her clinical skills by specializing in complementary medical therapies, studying acupuncture at UCLA, the nation’s leading center for training physician acupuncturists. She also has attended seminars by some of the world’s leading acupuncturists from both Japan and France. Dr. Steinmetz, who also has studied botanical medicine at Columbia University, has been a frequent lecturer on acupuncture, herbs and complementary medicine in pain management for physicians in the Washington, D.C., metropolitan area. She is passionate about exploring treatment modalities within the field of complementary medicine and determining which are appropriate for a comprehensive medical practice. She also is interested in helping other physicians explore complementary treatments that may be valuable within their specialties. Join in and write your own page! It's easy to do. How? Simply click here to return to Featured Antiaging Doctor.